Welcome back to another installment of our Create-A-Greeting-Card Scholarship Contest Look Back Series. 2007 was the first year that we started running an annual scholarship contest and we weren’t exactly sure what to expect. Since we are constantly on the lookout for ways to give back, we thought this was an excellent way to help a student that tied in perfectly with our products. It was our goal to inspire the youth to recognize quality and beauty and to capture it, whether that be in the form of a simple digital photo or a finished piece of art from their art class or computer lab. We were all nervous because we were not sure how it was going to turn out but in the end we were blown away by the response. We received over 15,000 entries in that first year! It caused us all to take a step back and really see that this was something that clearly needed to continue. 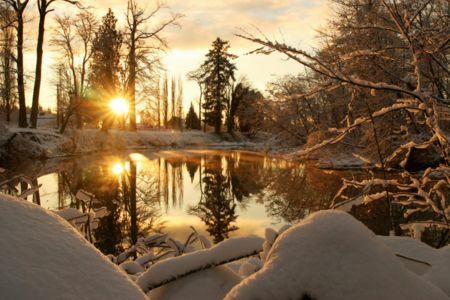 In the end, Elizabeth Digre was selected as the winner for her beautiful entry depicting a stunning winter scene of a lake surrounded by snow covered trees and the sun shining through the branches. After the entry was selected as the winner, our artists turned it into the stunning Season’s Greetings Golden Snowscape Card. The card was stamped with gold refractive foil and enhanced with some embossing (raising some details of the image to give it a three dimensional effect). The gold foil was used to accentuate the snow covering the trees to really make the design pop. 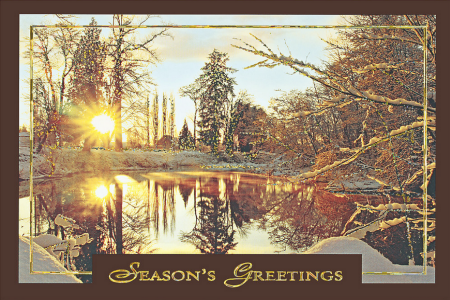 A frame was also added around the image to draw the attention to the beautiful winter scene. Once we saw the final product we knew that this contest was something that needed to continue. That photograph is so pretty. I can see why it won your contest. It turned into a really pretty card also. I’d love to see it framed in gold foil, too, in place of the brown frame it has now. That would really make it stand out.